". . . important to America and all the rest of the world in ourstruggle to design rational, wholesome, and productive landscapes." --Laurie Olin, Hanna Olin, Ltd. In the twenty-five years since it first took the academic world bystorm, Design With Nature has done much to redefine the fields oflandscape architecture, urban and regional planning, and ecologicaldesign. It has also left a permanent mark on the ongoing discussionof mankind's place in nature and nature's place in mankind withinthe physical sciences and humanities. Described by one enthusiasticreviewer as a "user's manual for our world," Design With Natureoffers a practical blueprint for a new, healthier relationshipbetween the built environment and nature. In so doing, it providesnothing less than the scientific, technical, and philosophicalfoundations for a mature civilization that will, as Lewis Mumfordecstatically put it in his Introduction to the 1969 edition,"replace the polluted, bulldozed, machine-dominated, dehumanized,explosion-threatened world that is even now disintegrating anddisappearing before our eyes." 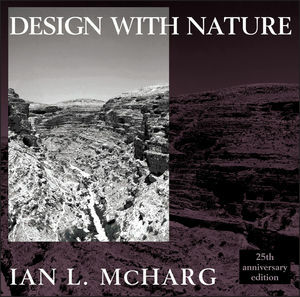 IAN L. McHARG was the founder of and is professor emeritus in the Department of Landscape Architecture and Regional Planning at the University of Pennsylvania. Known as the father of ecological planning, his landmark design projects include The Woodlands, Texas, and Amelia Island, Florida. Professor McHarg has received numerous honorary degrees and awards, including The National Medal of Art, presented by President Bush in 1990. The Cast and the Capsule. The World Is a Capsule. The City: Process and Form. The City: Health and Pathology.